What is every woman with fine hair's desire? Volume without heavy product. 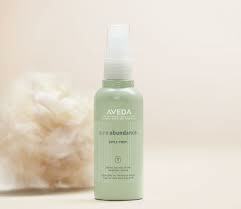 Aveda's newest product Pure Abundance Style Prep gives hair that natural, weightless feeling. Thicken hair with the botanical blend of passion fruit, rice bran, acai oil, organic aloe and acacia gum. The natural corn-derived polymers help give limp, fine strand a boost of volume that lasts all day. Aveda's Pure Abundance Style Prep is a great detangler because of all of the weightless conditioners that prevent breakage. The Pure Abundance Style Prep is not only a great foundation for creating body for limp strands, but the micro-mist preps hair for second day of volume-without adding weight. Some of our guests have been loving it as a dry shampoo on their non-shampoo days to absorb excess oil. Watch Antoinette Benders, Aveda's Global Artistic Director, create weightless volume in three different styles. Click the Aveda link below to see the steps to creating all day volume.